When you hit the road in a new Volkswagen, know that you're driving a vehicle that delivers top-notch performance and innovative technology. 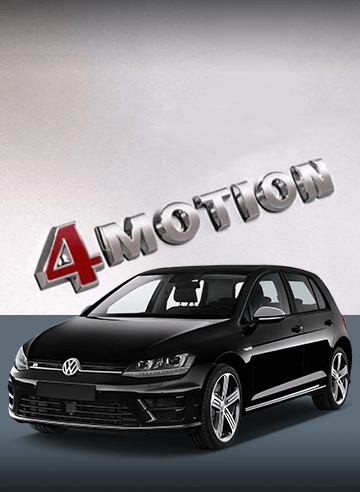 Many Volkswagen models are now equipped, or can be equipped, with Volkswagen 4MOTION® all-wheel drive technology. You'll be able to take on the tough terrain or whatever Mother Nature decides to throw your way as you sail down the Pennsylvania interstates. Learn more about what Volkswagen 4MOTION® all-wheel drive technology can do for you, then come to our Volkswagen dealership near Lancaster, PA , and speak with the sales team about taking an all-wheel drive VW for a test-drive! Volkswagen 4MOTION® all-wheel drive helps provide drivers with superior handling and control with its state-of-the-art engineering. When you take to the streets in a new Volkswagen SUV or sedan, you and your passengers will enjoy peace of mind at every turn. The 4MOTION® all-wheel drive system sends power to all four wheels of your vehicle, allowing you to maximize control. When integrated with electronic stability control, traction control and anti-lock braking technologies, you'll benefit from improved handling on even the slickest of roads. Volkswagen models that come equipped with 4MOTION® all-wheel drive certainly offer you enhanced traction during wild weather, but there are many other benefits to buying or leasing an all-wheel drive Volkswagen. Certain VW models are configured to send 90 percent of the engine's power to the front axle and 10% to the rear axle during normal drive conditions. However, if the terrain or weather changes and the system detects slippage, it delivers a more even distribution of power so you can enjoy improved handling. There are actually two 4MOTION® all-wheel drive systems available for VW models. The 2017 Volkswagen Touareg SUV offers an all-wheel drive powertrain to maximize your vehicle's powerful performance. Volkswagen Golf models, however, have a different 4MOTION® all-wheel drive system that manages power distribution from electro-hydraulic coupling. The new 2017 Volkswagen Golf Sportwagen can be equipped with this 4MOTION® all-wheel drive system, and it comes standard on the 2017 VW Golf R and the 2017 Volkswagen Golf Alltrack. See the new Volkswagen inventory and take a look at the models we have that offer 4MOTION® all-wheel drive. Then, contact Volkswagen Reading today to speak with our team of experts and learn more about Volkswagen 4MOTION® all-wheel drive and what it can do for you.